At the Bike Expo New York over the weekend, I got the chance to meet Jeff Crystal of Voltaic Systems, a New York-based maker of photovoltaic systems. 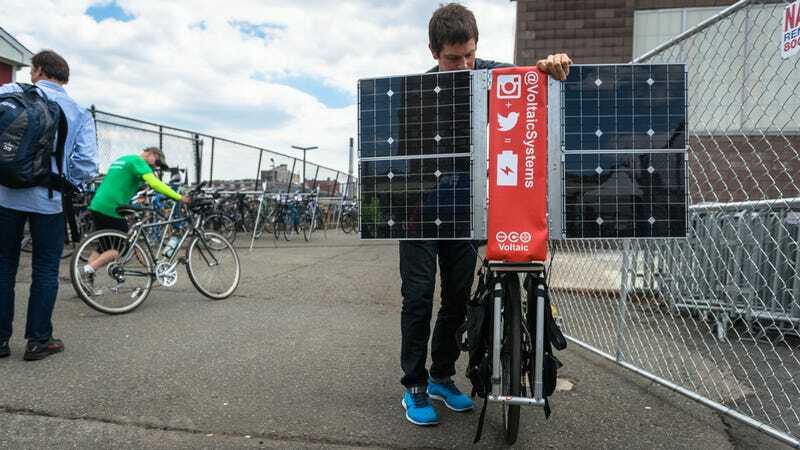 Crystal built a mobile charging station on the back of his bike that can supply devices with a charge within minutes. If there ever was an apocalypse–this is the guy to know. As I chatted with Crystal, he picked up his bike from the valet and, after two or three minutes, had it set up perfectly. He explained that it's just a fun project he wanted to do–he has no intention of attempting to build a production model of a bike like this any time soon. The four solar panels, which are the same as those used on Voltaic's Solar Laptop Charger, feed into a battery. The battery then feeds into a bunch of different connectors for mobile devices. The connectors are interchangeable and charge cell phones remarkably fast. They also attract plenty of attention—by the time we had it built, several people had come up and asked Jeff about the bike. Now the bike is more compact. The catch is that the panels can't go up while the bike is moving–they aren't secure enough. But then again it's just a pet project for Jeff so I'm sure there is an easy solution. I'm looking forward to what v3 ends up being. But in the meantime, you can come check out Jeff's ride, and hear him talk about it, at Gizmodo's Home of the Future on May 18—we'll have plenty more details about it soon.